Nodo is a van gnome. That means that he lives in a van, hiding for the most part and tidying up when the humans aren't around. One day, on the way to a visit to the vet, the family cat gets at him and he is forced to abandon ship. Out in the world, Nodo, who has an absolutely horrible memory, attempts to find his way back home. On his quest he runs into a great many interesting characters, including another van gnome named Flora, a sewer dragon, a tribe of forest gnomes, a couple of trolls, and some cows. Some of these creatures are more helpful than others, and a few are downright dangerous. I found this book charming and wonderful. Its internal logic and magical creatures make up a fun and exciting yarn. 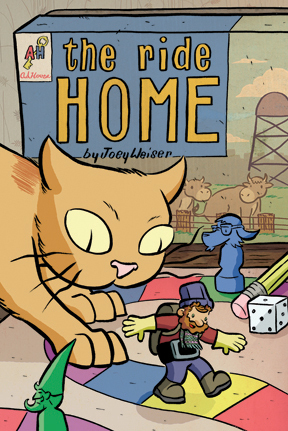 It was created by Joey Weiser, a cartoonist who has published a few other books and mini-comics, including Tales of Unusual Circumstance, Cavemen in Space, and the forthcoming Mermin. He speaks more about The Ride Home and his early career in this interview. This book was Weiser's debut effort, and I enjoyed it, but some reviews I have seen online have been rather harsh. Publishers Weekly found it stiff and concluded that "the story never takes off." Brian Gardes found it derivative and wrote that it contained "way too many coincidences for me to look beyond this pale imitation of Bone." Johanna Draper Carlson offered a counter view, calling it "a wonderful, engrossing all-ages story for anyone adapting to a new environment," and adding, "It’s a lovely reminder of the importance of friendship, too." 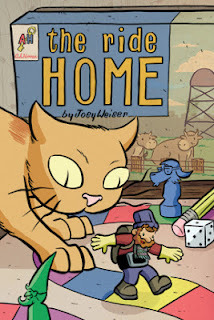 This book was published by Adhouse Books, who provide a preview here. For the more frugal or those who want more of a preview, the author has posted the entire book here on his official site. Curses! 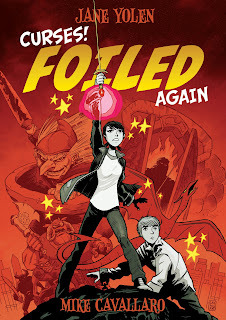 Foiled Again is the cleverly titled sequel to Foiled, wherein Aliera, a high school student, competitive fencer, and our heroine, finds out she has become the guardian of the faeries on Earth. Also, she has learned that Avery, her cute, popular lab partner, is actually a troll. Literally. That much gets tidily summed up at the start of this volume, where we learn that Aliera's new guardian role is attracting all kinds of unwanted attention. First it comes from Avery, who is beholden to her for saving his life, and second from Baba Yaga, the fearsome witch from Russian folklore. As the story progresses, there are many twists and turns. It becomes unwise to trust appearances because some seeming allies are anything but, and help comes from some unlikely places. There is also a soap opera quality to the characters' relationships that makes for some convoluted drama and intrigue. This book is a collaboration between Jane Yolen and Mike Cavallaro. Yolen is a huge figure in children's and YA literature in the past century, having authored more than 300 books and won multiple awards and accolades. Her most famous works are probably Wizard's Hall, Owl Moon, and The Devil's Arithmetic. Yolen spoke about her work on this volume in this interview with the School Library Journal. Cavallaro has been making comics since the 1990s and he is known for his work on Parade (with fireworks), The Life and Times of Savior 28, and more recently books starring Batman and Superman for younger readers. He has a clear, bold storytelling style that propels this tale of warriors and fantasy creatures briskly. I also like his depictions of the various magical creatures, including witches, faeries, and trolls. He gives them fun details and expressions. Also, the way they are colored makes them pop on the page. Reviews I have read about this book have been positive but measured. Kirkus Reviews gave it high marks, stating "the book offers a lot of fast-paced fairy-tale fun, and Aliera is both admirable and easy to relate to for her fierceness and foibles." Eric Henrickson enjoyed the first book but wrote that he found "there’s too much yelling and not enough story in this one," which left him disappointed. The teen reviewer at Publishers Weekly had mostly praise for the book, "The story line has heart and intelligence, and Yolen successfully weds faerie lore to cinema-style plot twists; the only weak spot is the occasionally clunky dialogue." A preview and more is available here from the publisher First Second. 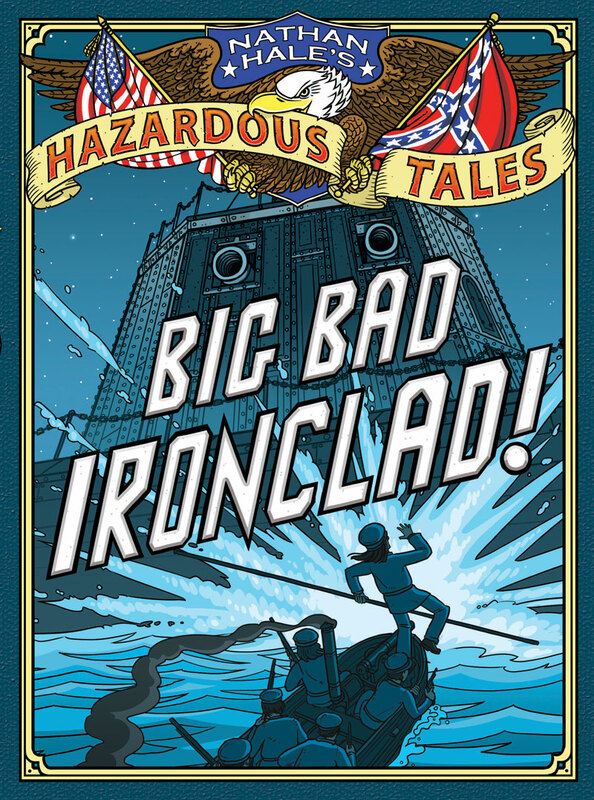 The second book in the series of Nathan Hale's Hazardous Tales, Big Bad Ironclad gives an account of the "Anaconda Plan" of General Winfield Scott to cut off the Confederacy's access to supplies and major water routes. This plans kicked off an arms race between North and South. In response to this move, the southern forces attempted to break blockades and were aided in their efforts by the creation of the first ironclad vessel the C.S.S. Virginia (formerly called the U.S.S. Merrimack), which could ram and destroy wooden ships. Faced with this new, devastating technology, the Union was forced to respond with its own upgraded vessels. Their first ironclad vessel, the U.S.S. Monitor, was commissioned into combat in order to turn the course of the naval conflict. I really enjoyed this book. It and its precursor might just be the best Social Studies focused graphic novels I have ever read. One of the big surprises I got reading this one was just how much I did not know about the people involved in the American Civil War, particularly a complete ignorance of the exploits of William Barker Cushing. He was decorated for multiple acts of bravery on the Union side, for example, sinking an ironclad ship with a spar torpedo. Hale also did an excellent job portraying other notable figures such as Secretary of the Navy Gideon "Father Neptune" Welles, Confederate Navy Secretary Stephen Mallory, Assistant Secretary of the Navy Gustavus Fox, and the innovative Swedish inventor John Ericsson with memorable verve. Another surprise I got reading this sequel to One Dead Spy was that it was actually completed before the ostensible first book of the series. Creator Nathan Hale also has drawn two other graphic novels, Rapunzel's Revenge and its sequel Calamity Jack, as well as a variety of children's books, including Frankenstein: A Monstrous Parody and The Dinosaurs' Night Before Christmas. He shares a lot of fun artwork and news via his blog. Reviews I have read have been positive, commenting on the crisp art, humor, and well-researched information. Kirkus Reviews called it "livelier than the typical history textbook but sillier than the many outstanding works on the Civil War available for young readers," and added, "this will appeal to both history buffs and graphic-novel enthusiasts." Degolar offered his opinion, "The book pulled me in and kept me eagerly engaged to the end. And, perhaps most importantly, when I finished I wanted to know more about the people and events depicted." Librarian Laura Given enjoyed the book, writing, "This book grabbed me from the first frame with its goofy hangman character who loves Children's Story Hour - all the way to the back matter where author Nathan Hale admits to outsourcing his research for the book to adorable babies." Big Bad Ironclad! is published by Amulet Books. There is a preview available at Amazon. Teenage superheroes have been a successful enterprise since the days of Robin and Spider-Man, but here they are given a quirky twist. Owen Craig is a young man living in the small town of Burnbridge on Sea. One night whole he is out gallivanting in an abandoned building he encounters a ghostly girl, gets shot, falls in some mud, and gains super powers. The only catch is that his body appears to be turning to mud. 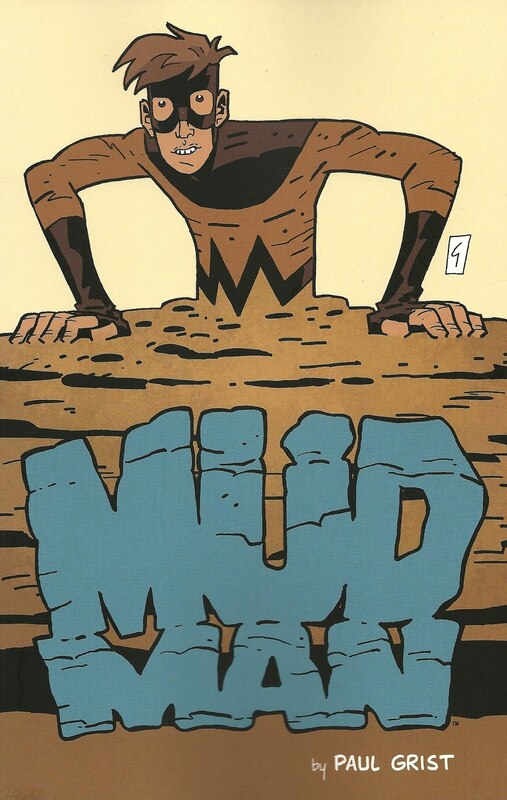 Complicating matters, his dad is a detective investigating some instances of vandalism and when he confronts a band of robbers, Owen jumps into action to use his new muddy powers to save him. In the meanwhile, Owen also has typical teenage issues, such as dealing with bullies, trying to date girls, and dealing with sometimes turbulent friendships. There are many mysteries to be dealt with, including who the ghost was, where his powers came from, and also the identity of a stranger who has blown into town and knows way too much about Owen's plight and abilities. He does not quite know who is his friend or foe. Writer/artist Paul Grist is a Brit comics creator known for his unusual superhero series Jack Staff as well as the police drama Kane. He has been making comics professionally since 1986 and is known for his creative layouts, clean lines, and clever use of shadows. He speaks extensively about his work on this book in this interview. Reviews I have read online have been very positive. 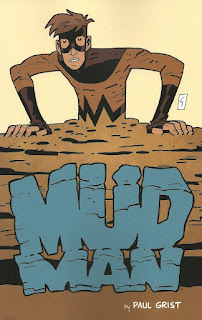 Mick Martin gushed, "Paul Grist breathes fresh air into the teenage superhero story with Mudman." Chris Sims wrote that the series has "a ton of potential to bring his signature style, masterful technique and bold new ideas to the kind of story that most comics readers already love." Colin Lalley added, "It's fun. It tells a good story with good characters and doesn't get caught up in how it will be perceived. It's funny and action-packed and captivating and accessible." This book collects issues 1-5 of the comic book series published by Image Comics. Some preview pages are available here from iFanboy. That's Glory in the middle. 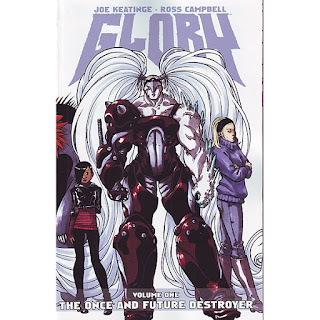 I have to admit I had only read one Glory comic book before now, and it was written by the much-celebrated Alan Moore, but I cannot for the life of me remember anything about it. This book makes a pretty big impression. 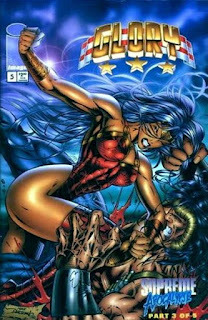 The plot follows the exploits of Gloriana Demeter, the offspring of an Amazon and a Demon (here shown as alien races). She straddles both races, but eventually chooses to lead neither and breaks from her parents to become a protector of Earth. Her exploits began in World War II, but when this book begins it is set in the present day where Glory has been missing for years. A young Asian reporter named Riley has an uncanny lifelong connection to the superheroine, constantly dreaming of her and tracking her across the globe. She finds what she's looking for in an extremely off-the-beaten-path locale, and nothing turns out as she thinks. I don't want to spoil things too much, but there are many twists and turns, and each chapter ended with a cliffhanger that kept me wanting to read more. The Once and Future Destroyer is serial comics at their most enticing and engaging. This book, which accounts for half of this particular Glory saga, was the co-creation of Joe Keatinge and Ross Campbell. Keatinge is a writer known for his new superhero-themed series Hell Yeah as well as co-editing the Eisner and Harvey Award winning anthology Popgun. Campbell is an artist and writer known for his goth-horror-comedy series Wet Moon, his webcomic Shadoweyes, as well as his atmospheric and deft drawing abilities. You could drop the "l" from the series name to describe the action and battle scenes, but Campbell also excels at portraying the quiet character moments as well. Here is an interview with both creators speaking about their collaboration. This book has received much positive attention and has appeared on many Best of 2012 lists. Publishers Weekly captured much of the flavor of reviews I have read and praised both creators' contributions to this book, "Campbell's art is stunning, creating a female hero who is physically intimidating in a way never seen in superhero comics and creating worlds both familiar and fantastically bizarre, and characters ranging from friendly old French bartenders to armies of individually distinct demon-like creatures from another world. Keatinge's story gives instant depth to its complex characters and excels at slowly presenting a more and more complex narrative spanning thousands of years and several worlds and cultures." The Once and Future Destroyer is published by Image Comics. This review from samax amen provides some preview pages. Campbell also provides a number of preview images and summaries from each chapter of this book at his website.